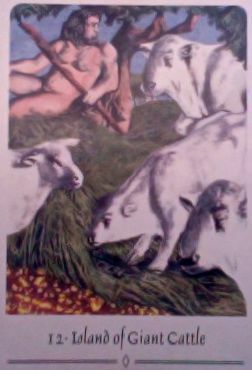 Today's Draw: Island of the Giant Cattle from the Celtic Book of the Dead oracle. Is there a situation in your life right now that you feel a need to exert control over? Is there one where you really just don't trust another person to do their job? Can you look beyond those issues to see where they are generated by your own fears and lack of self trust? Also known as Island of the Beefy Nekkid Dude, the Island of the Giant Cattle is a card that talks about a couple of different concepts that are intertwined. The first is that, no matter how hard you try, there will always be some things that defeat you. And the second is that an inability to trust those who may know better, could be one of those things defeating you right now. And a third that I'm adding from my own head is that an inability to trust yourself could be what's really at the root of all that. As a nicely compensated consultant, I'm always surprised at the clients who don't trust your recommendations and/or actually stand in the way of doing your best work because they don't trust you to know your business. What it really comes down to is a fear...that if they don't exert control over every phase, that the project will most surely fail. Ultimately it's not me they don't trust, it's themselves, in one way or another. So they will hire me to write a website, for example, then they'll change so much of what I write that the content ends up sounding just like the last website they had...the one they wanted to change...the one they wanted to sound different from. And the reason it sounds like the last one, is because they did the same thing last time to some other copywriter who now won't take their calls. They don't trust themselves to make the right hiring and management decisions to set the stage for success, perhaps because they've never managed a project like this before or maybe they've been unsuccessful in the past. So they end up carefully shaping the very thing they fear—defeat—into reality. Just for the record, the people I maintain as clients aren't like that. I've said before and I'll say it again, I have the world's best clients...people who see my value and truly appreciate the work I do for them. Many of them have been working with me for 10-15 years. They put their trust in me and that's how I like to work. It makes me want to aspire to my best. So, when I'm so "strict" about letting the professionals do what they know how to do, how come I find myself ignoring advice I get from professionals who know better than me? I certainly don't do this all the time. Most of the time I trust. But I can see in two places of my life where I'm feeling "defeat", that I'm also not doing what the professionals I've hired are telling me to do. What could appear like overconfidence, an inflated sense of self importance or control issues to the professional whose advice is being ignored, is, in my case, my own self-trust issues. In one case I have so little trust in myself based on choices I've made in the past, that I'm just plain afraid to do what it takes to change. It's a very complex bundle of emotions with that particular issue. But in the end, I'm both afraid of failure and untrusting of myself. And the end result is a cycle of failure, the very thing I'm afraid of. In the other case, it appears more like I just don't trust life to take its own natural course. Because it's something that just needs time to work itself out. But underneath the difficulty in just surrendering to time and the process, is a lack of trust in my own ability to happily adapt to any eventuality. It isn't until I remind myself that I'm really good at doing that, that the stress and worry that causes the mistrust melts away. So you see how it works? Sometimes it's hard to see how your mistrust of others is actually mistrust of self. But it's there. What does all of this evoke in you?